My colleague Alan Buckingham reviewed the Kindle Fire HDX 7 over the weekend. I too have been testing the new HDX variants of Amazon's tablets and share many of my colleague's sentiments. However, for me, one of the most intriguing things about the tablets is not a feature but an associated accessory -- the Origami Case. If you aren't familiar with the word origami, it is an ancient Japanese art form involving paper-folding. One of the typical clichéd objects to represent with origami is a crane (the bird, not the construction equipment). However, the number of objects to create is limited only by your imagination. Heck, you've probably done origami and never realized it -- ever make a paper airplane in school? Well, it turns out you were an artist; not a troublemaker! Since Amazon's tablets are generally focused on consuming media, it only makes sense to prop it up for optimal viewing. However, the user will likely want to protect it with a case too. While the company could have designed a case with a basic kickstand, it chose a more creative approach with the Origami Case. Much like the aforementioned art form, it allows you to fold the front flap to create an improved media experience -- when you fold it up to be a kickstand, the magnets hold it all in place. The end result is a funky fortune-cookie-like appearance. This allows you to place it on a nightstand, kitchen table or anywhere that you want to watch video. The kickstand even works in both portrait and landscape modes without additional manipulation. Not only does the case improve video consumption, but audio quality too. You see, the tablet's stereo speakers are located on the rear. Sadly, this causes the sound to be projected away from the user. The origami case is designed to redirect the audio at the user. And boy-oh-boy, does it ever work. When watching Dr. Who on Amazon Prime, the audio was magnificent -- the best I have heard on any tablet. 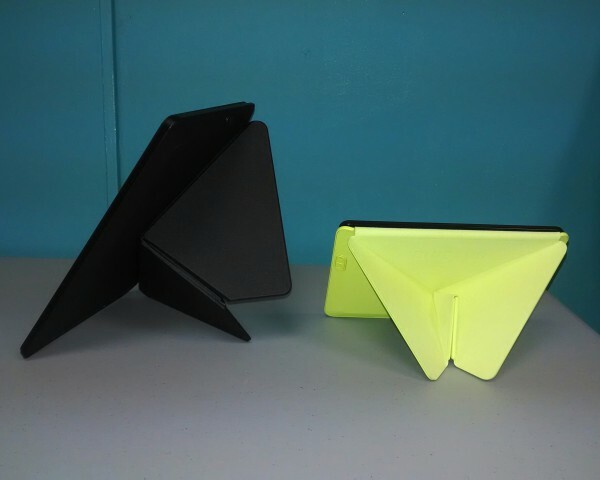 While the Origami Cases for the 7-inch and 8.9-inch tablets are mostly identical, the larger one has an additional feature. Both tablets have a front camera, but the bigger one has a rear camera too. Seemingly, the case blocks the camera, and it does, but that is a good thing as it protects the lens. You can slide the tablet upwards to expose the camera. Like magic, this action launches the camera app. It is a really cool feature, which some will argue is gimmicky. To them, I would say the lens protection makes their argument moot. While features are great, the most important aspect of a case is protection. After all, if the case doesn't protect your investment, what is the point? I am happy to say that the Origami Case offers optimal protection. The plastic used is extremely hard and durable. The case is like a tank -- you can be confident that your Kindle Fire HDX is well protected. Sadly, this protection comes at a cost. When coupled with the actual device, you are going from a surprisingly light tablet, to a brick. While this would normally be problematic, the device is remarkably easy to remove from the case. You see, Amazon chose to utilize magnets here too, to secure the device to the case. This makes the tablet easy to separate from the case when it is not needed. Besides the weight, the only other downside is the price. The 7-inch case is $49.99, while the 8.9-inch is $54.99 (for an additional $15 you can upgrade to leather). This is a lot of money to ask to protect a fairly inexpensive tablet. I would like to see Amazon reduce the cost by about $20.00. So, should you buy it? Absolutely. True, it is expensive, but you get what you pay for; it is durable, functional and looks darn good too. If you are buying into the HDX experience and Amazon ecosystem, you might as well go all-in and buy the official Origami Case. My suggestion? Forgo the leather option and save some cheddar. Recommended.